Braced girders were introduced in 1915 but not added to outfits until they were reorganised in 1921. They were initially supplied only in the Inventors Outfit A, and the number of these that are found shows how successful that accessory outfit was. Very unusually, the part was shown in many models in the manuals from as early as 1916. No doubt this helped to sell the parts! As you can see from the table above, additional sizes were added through to 1926, and the full range was available right up to 1962. The change to single braced girders also saw the dropping of the 2½'', 3'', and 4½'' lengths. Meccano claimed that these lengths couldn't be made single-braced, but this is obviously rubbish. In fact, although the braced girders were very well supplied in the pre-war outfits, they were effectively replaced by the flexible plates. From 1937, the only part supplied in any outfits was the 5½'' braced girder, joined by the 12½'' in 1962. DMS/EMP shows all sorts of strange dates for the braced girders. As a result, the table below has been thinned down until we find more examples. The image below shows the five most significant changes to the ends of the braced girder through the years. Chronologically from left to right, these are the open ended (both square and round ended), then the closed ended (most common version), then the single-braced version from 1962. The right-hand example is French production, also supplied as a UK product from 1985 to 1992. The other change happened right at the very beginning of production, between around 1915 and 1918. In what is thought to be the original type of braced girder the bracing is noticeably thinner than the bracing on all later versions. The "thin" types are around 0.19'', (4.8mm or around 3/16''), and the "thick" around 0.21'' (5.2mm or almost 7/32''). However, this is very difficult to measure. There are many early square-ended braced girders with such variable stamping that there are braces between these two sizes on one part. 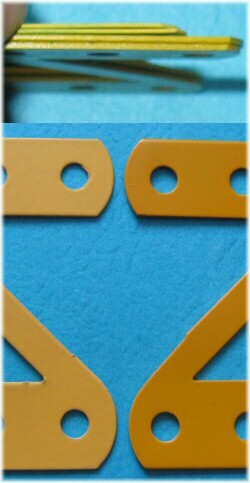 Even later dark green and medium red girders often have braces between 5.0 and 5.5mm on the same part. However, there are some parts as you can see from the right that have entirely narrow braces, and it is these that are thought to be the earliest type. On some parts such as the 5½'' girder these are relatively common, but on later-introduced lengths such as the 2½'' girder they are very unusual. This change in frequency leads us to believe that the narrow-braced girders are the earlier ones. However, you may note that part 97.ni below, the round-ended later version, clearly has narrow braces although all its brothers have wide braces. Isn't that interesting? At some point in the mid-70's, three of the braced girders (97, 99a, and 99b) changed subtly, to have rounded inside corners as you can see from the before-and-after photograph right. For some reason, the 12½'' (part 99) and 5½'' (part 100) didn't change, retaining the sharp inside corners. These parts were of course the only ones supplied in outfits at the time. Later, however, part 99a was included in the Crane Multikit, and these are all found to be rounded. In fact, it is thought that all versions (as spare parts) of 99a, 99b, and 97 were rounded. With the change to dark yellow in 1978, the shapes remained. Thus, dark yellow versions of 97, 99a, and 99b always have rounded corners (including the 99a in the later Crane Construction Set), but dark yellow parts 99 and 100 have sharp corners. Then we have this yellow girder shown, where the girder is fractionally longer than 15 holes because of some kind of slip in the machine. The inset clearly shows where the holes go out of step with the normal red girder. As you can see, the final brace is thicker too, implying that the girders are made using some kind of rolling press tool where the braces and holes are stamped together. French production of braced girders gave up the closed-end version quite early (possibly 1955? ), and kept this open-ended braced girder style with the change to single-bracing in the 1960's. 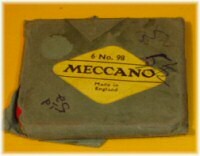 It appears that the same styles were used by 'Meccano – Industria Argentina', an officially licensed Meccano factory in Argentina between 1967 and 1985, who are now known as Exacto and continue to make Meccano-compatible parts. Of course, Exacto parts made after 1985 are not officially Meccano parts. Not an issue for a builder but something to know if you are collecting parts! If you look carefully there is a difference. 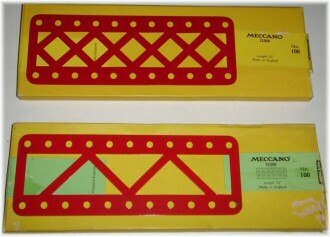 The Exacto braced girders (shown right and bottom in this picture) are slightly darker yellow, and slightly thicker than the Meccano France part (shown left and top in this picture). A problem then, with the part below. Ed shows us an example of a French yellow (1983-on) part 100a, received from France through the Canadian distributor. It isn't Exacto, but Meccano France don't show this part as existing in any colour. For the moment, we'll have to file this one either as an experimental part or as a factory mistake. 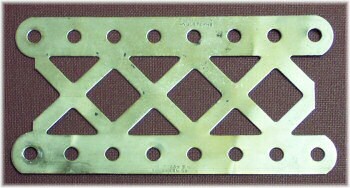 John Bader also gives us our next oddity – this eight-hole open-ended nickel plated part. Look very carefully. He has, and is as certain as he can be that there has been no cutting. But if you look even closer you'll see that there are no larger braced girders of this type that it could have been cut from. The strange left-hand end style only appears on the 3'' braced girder. Although one stamping is slightly offset the other one is central. John has two of these from the an enormous nickel collection of the late Frank Beadle. We're going to have to assume that they were special model room parts, I think. I have a huge supply of Braced Girders. A legacy of saying to G. Maurice Morris "send all you have" before realizing just how many he had! Anyway, while recently sorting through my supply I came across the attached. Square ends which we assume ended around 1918. Marked Fabrique en Angleterre which should have started in 1921. So, as far as a date just where does this part fit? The Meccano marking is much more pronounced than the rather feint FEA. Old stock restamped to make them marketable? You might note that in the "Further Information" at the bottom of this page, a contributor named Brian refers to these square-ended MFEA parts in "both short and long lengths". It's quite possible to imagine that an overstocking of square-ended braced girders was sent to France in 1921 or later and had to be overstamped to make them comply with the new regulations. 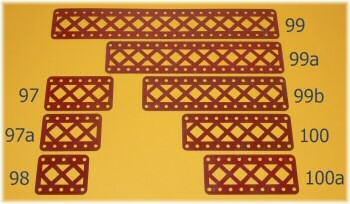 Shown above is a post-war pack of 2½'' braced girders, part number 98. To the right, the sequence of red braced girders is clearly shown with examples of part 99b, the 7½'' braced girder. From top to bottom: brown paper wrapped girders, followed by the yellow box with a yellow label and part number (12356). These date between 1954 and 1957. Below that, the label changes to light green to signify the new colour scheme from 1958, and the parts are light red double-braced girders. At the bottom of the picture is a pack of the new design of single-braced girders dating from 1962-64. Note that the label hasn't changed, and still shows a picture of the double-braced girder. The 5½'' braced girders part number 100 to the right have the same sequence. 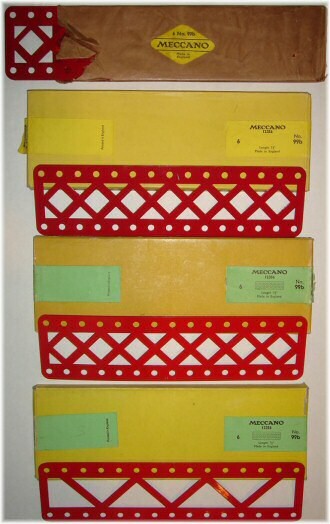 Shown are the 1954-57 medium red parts in a yellow box with yellow label, and the 1962-64 light red single-braced girders in a yellow box with light green label. Note that the boxes are considerably larger than they need to be – in common with many spare parts packages they share boxes amongst many sizes. Note: ¹ Often found in the Crane Multikit, all yellow and dark yellow versions of parts 97, 99a, and 99b had rounded inside corners from the mid-70s onwards. ² From Master Set 7064. Total number of messages on this page: 16. This is page 1 of 3. I have a one and a half inch (3 hole) braced girder. It is open ended, round cornered. No Meccano stamp is visible, but it is shallow on these parts and could well have been worn off with emery cloth when cleaning it up. I have a large set assembled in 1916-18 in the Us. In addition to the usual square open end nickel girders, there are some single braced, angled, square open end 12.5" nickel girders. I can' find these parts listed. Are they Meccano, or smething else. anyone know anything? Kendrick, I'm sure the nr 1 of 1930 had braced girders. I had one when I was four. It was in fact the spanish version or 1959, that had not changed since 1930. I still have one of the parts.